Custom Mapping and digital GIS maps and data including current Australian postcodes – we won’t be beaten on price – for a location enabled world. 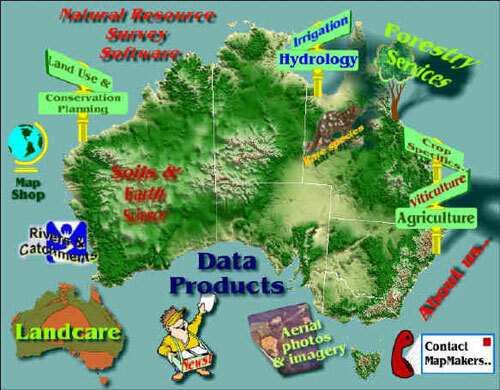 MapMakers Australia have over thirty years of experience in data collection, analysis and functional custom map production, specialising in franchise and territory area mapping, sales, marketing and customer demographic analysis. While we build demographic data into our postcode geography data range, we are ready to integrate many other data sets including the 2019 annual updates to ABS Business Count data. See the seven year illustrated trends for Sydney and Northern Tassie! In a smart and location hungry world, maps are getting smart too! The days of border disputes between neighboring franchisees are over – see how! 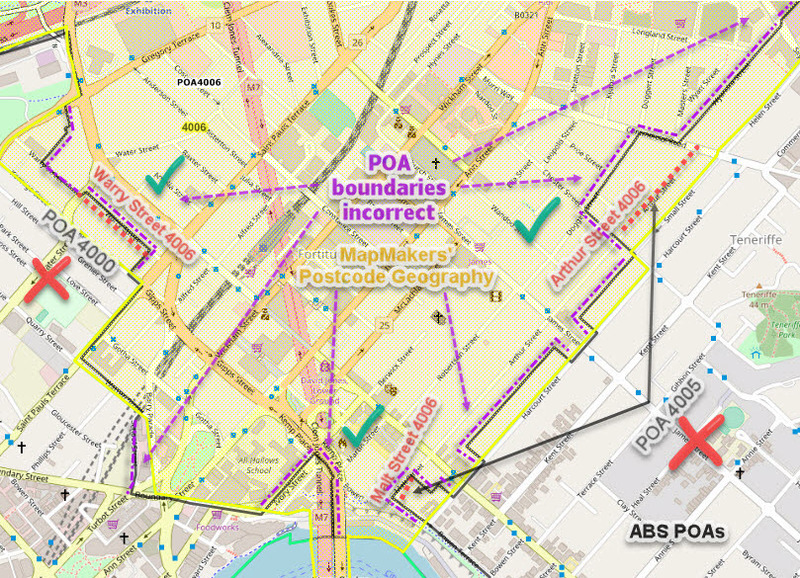 Why would you pay us for digital postcode geography, when you can download inaccurate, incomplete and out-of-date ABS postal areas for free? Check out our blog for the long version details! We have now completely updated all MapMakers Enhanced GIS data products with final (November 2017) release Census data. Not only do you get the most current postcode geography, but the most up-to-date Census data. Products available now. Check out our blog for more details! Free sample maps and data! Try before you buy! Includes our postcode area data samples in the almost universally readable Google Earth / Maps kml format and a variety of different sized example maps from A4 up to A0, all in accessible PDF format. 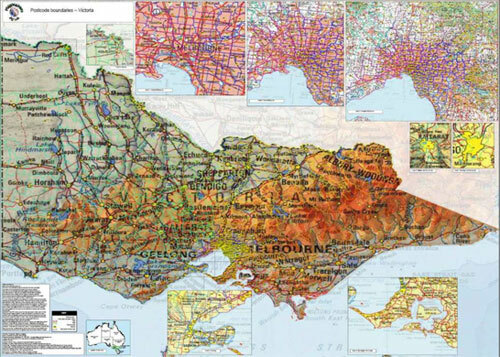 Plus giant Standard Australian Regions poster sized maps! Current (2019), accurate digital Australian Postcode Areas enriched with a comprehensive range of popular data from the most recent Australian Census. 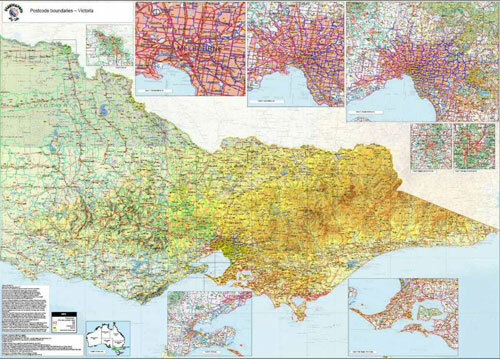 Our latest Map Series has two State / Territory A0 Postcode Map versions, plus the State Capital City A1 Postcode Map. All you need to view and interactively search these products is free Adobe Acrobat Reader. 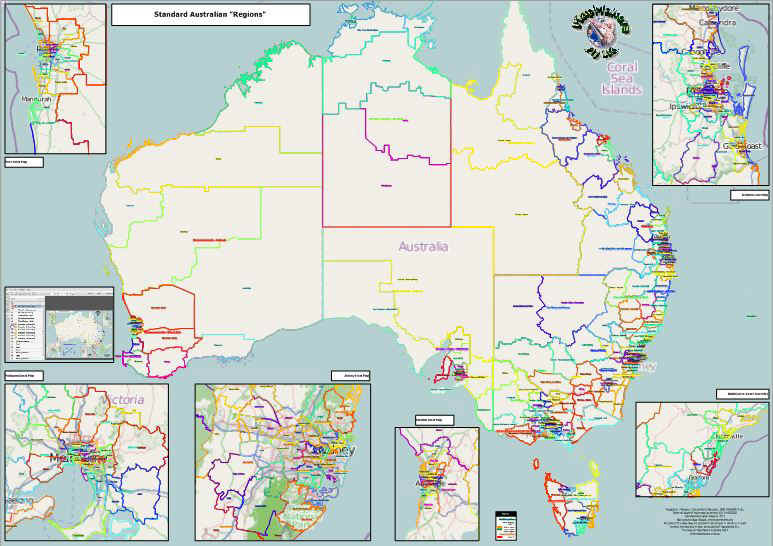 What’s more, all are updated to the very latest Australia Post definitive database level, that’s over 1,300 updates and additions in all States and Territories, since the Map Series was released in 2006! 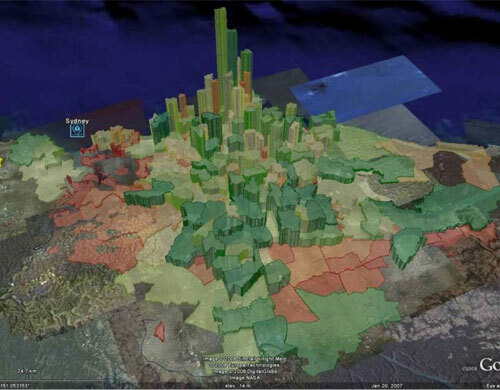 Custom Mapping to visualise your data. Use our premium Australian Postcode areas or many other popular data sets we have available. If we don’t have it we can probably get it! You can even supply your own digital map data and we’ll do the processing work for you..
View our latest information and new products on our MapMakers Australia Blog. We're all living in cuckooland..
We’re all in state of denial as the nature of our population shifts to “the east”..
A million empty homes - scandalous census snapshot! Scandalous headline in national press, but we look at the real facts behind the sensational media hype. Christianity, Islam and Secularism are the world’s three largest belief systems. Their distribution in our illustrated examples of NSW/ACT, Sydney and Tasmania show some interesting geographic patterns. Making sense of multiple data variables to guide your marketing and franchising operations. MapMakers Australia, decision support specialists. We’re an even bigger mix than ever, this post shows the change in percentage of total population born in China, between 2006 and 2016..
Changing business activity illustrated using ABS business activity data. New updates for 2017 release. 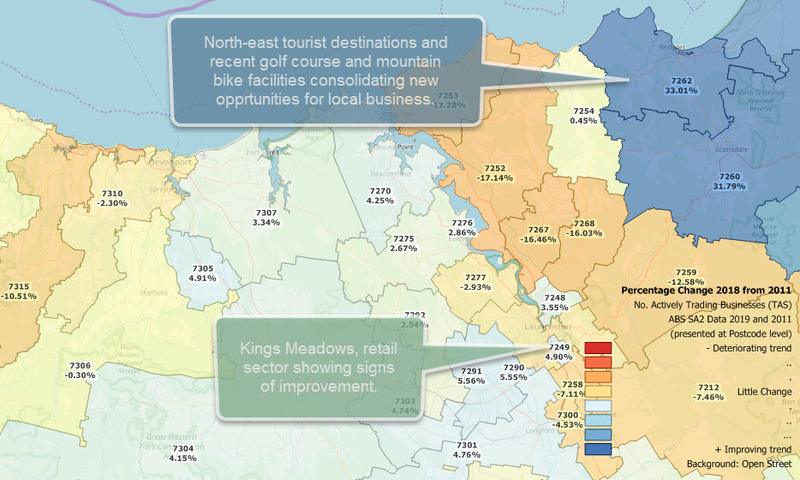 Greater Sydney changes to business activity by postcode area. Blamed for making housing unaffordable, amongst other things, the reality is Boomers are an endangered species. Insights from the most recent Census by postcode area. There is often confusion when people pay for a copy of Australia Post’s postcode list, it has over 16,000 records, but they’re not all suburbs, we give an illustrated explanation. Get web access to postcode areas and data via the web – illustrated examples and some cautionary notes about “free” stuff. Standard Regions of Australia – free poster map for download – great for narrowing down your own “area of interest”. With release of our latest Postcode Census Enhanced GIS Data products, we are pleased to include new example analyses and illustrative Australian postcode maps. 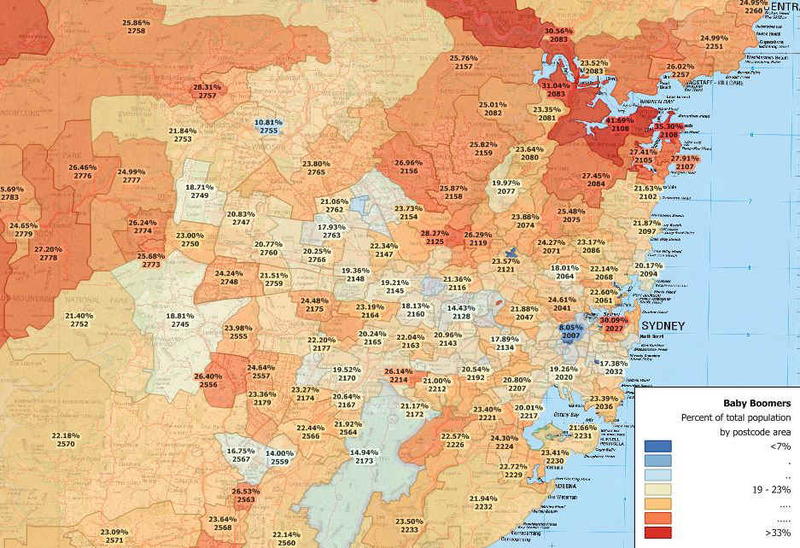 These include changes to weekly household income; absolute number of Internet connections by postcode and trends in Internet connectivity; plus overall population changes and trends in both regional areas of New South Wales and greater Sydney. We hope you find them of interest! New products and upgrade path options can be found by clicking the button below. If you are looking for comprehensive, up-to-date Australian Postcode area maps and data, you’ve come to the right place! Our comprehensive range of State and National Postcode Maps and GIS Data can be found via the top “postcodes” menu. We are so confident our products offer the best in currency and accuracy that we offer an unconditional price guarantee. If you can find a comparable product(s) at a verifiable lower price, we will beat it by 10%, guaranteed. We have over thirty years experience in data collection, spatial analysis and functional map production. 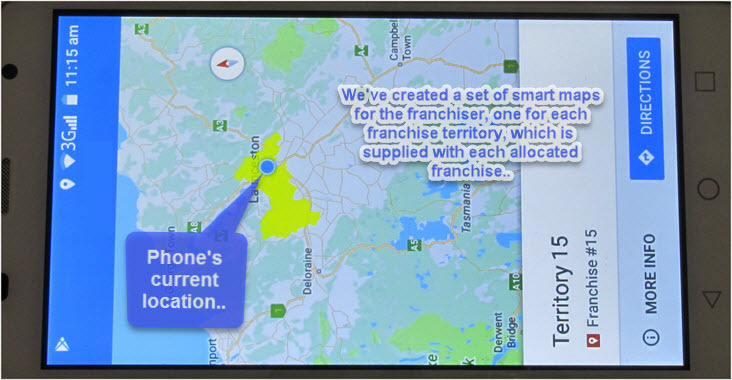 We specialise in franchise and territory area mapping, sales and customer demographic analysis. Our client base includes all levels of government, academia, resource exploration and processing, primary production and community groups. We also design and execute soil, geological, flora, fauna and heritage surveys. Having this breadth and depth of experience, we know what information already exists and what is likely to meet your specific needs. We also know how to access that information quickly and economically, on your specific behalf. You will be amazed just how much information already exists which of immediate and particular significance to you and your needs. Until now, the main obstacle to empowering yourself or your enterprise has been accessing and assembling relevant data. MapMakers remove those barrier, resulting in delivery of the exact information needed to answer your questions and advance your enterprise. For trouble-free custom mapping and map data for your individual or corporate needs, whatever they are. We specialise in custom maps of any size and in most digital formats. 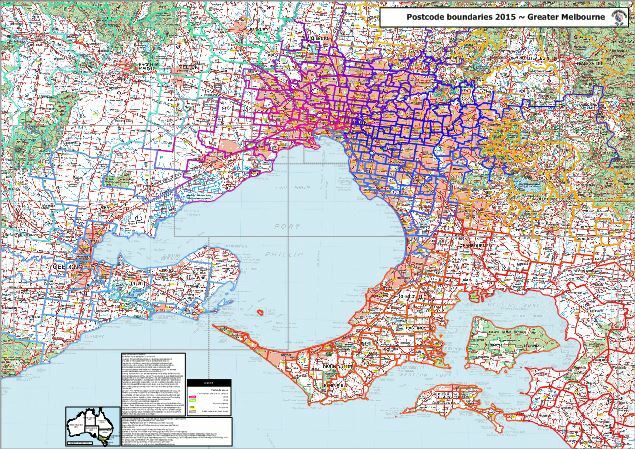 We create, maintain and supply the most accurate and current Australian Postcode Maps and GIS Data and can supply many other data sets including suburbs and current electoral boundaries. You no longer need to struggle with a seemingly impossible jigsaw of maps and reports from inaccessible government and commercial suppliers. Nor do you need to go to the often-wasted expense of buying your own technology, let alone the roulette wheel of finding someone to drive it effectively. MapMakers are proud to be associated with APESMA (Association of Professional Engineers, Scientists and Managers), and the Environment Institute of Australia. If we cannot attend your needs immediately, we will endeavour to respond the same business day.